£5,000 for wages for a Janitor and Revenue costs. £5,000 towards costs of soft-furnishings. £100,000 for the purchase of the site. £80K for refurbishment work to the community centre. £130Kfor new build of retail unit. £1000 towards installation of CCTV system. 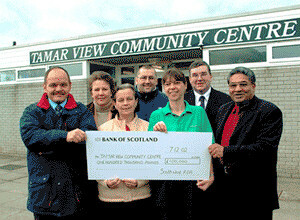 £12K for Youth Activities Project over the period June 2005 - June 2007. £1,500 for Laptops & Projector. £11846 for a Cookery Workshop, Taster Sessions and CIEH Level 2 in catering Qualifications. Between July 2009 - April 2011. £4000 to start up Parent & Toddler Group (May 2011) & £3441 Towards Digital DJ System & Laptops (Jan 2012). 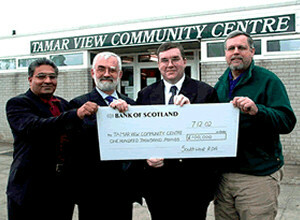 Presentation of the cheque for £100K to TVCC. Presentation of the cheque for £100K to Mr Patel and Mr Hawkings by Les Roper of the SWRDA and Mr Peter Clark of Annington Homes.